Why OrderTrac for Amish Furniture? With just a couple clicks, you can know what items are on order from a particular vendor. A customer ordered a table 2 years ago and now wants another matching chair. You can easily look up past orders along with vendor and color info. What Do Our Current Users Say? We have been using OrderTrac for 3 months now and absolutely love it! Having the PO’s automatically created from the invoice and being able to fax them directly from the software saves us so much time. 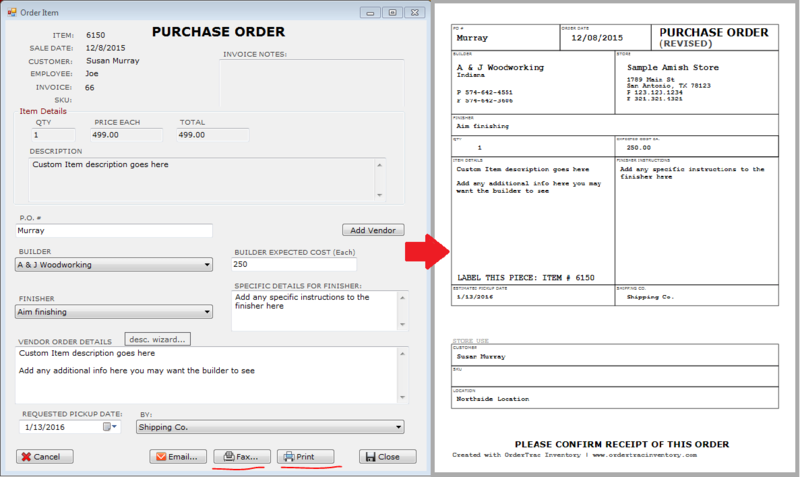 Some highlights for us is being able to use as many lines as you need for the description on the invoices. Our finisher appreciates the report we can print out for him showing all the items he will be receiving for us with the description, stain color, and builder specified. Thanks so much for creating OrderTrac, and especially for the wonderful support in always helping us with what we need in custom reports, custom labels, etc. OrderTrac is what we always dreamed of having… plus so much more! OrderTrac has greatly decreased the amount of time I spend at my desk tracking items and creating and submitting orders to builders. One of my favorite things about the program is the daily sales report sent to my email at the end of every day, so I know what's going on even when I'm not there. The time and stress this program saves me is invaluable. It would have been next to impossible to grow my business to the size it is without the help of OrderTrac keeping everything organized. I just want to say THANK YOU!!!! You have allowed me to realize a dream that started over 15 years ago. I know it may sound crazy but to have the ability to get the ancient system of ordering custom furniture by pen and paper on to an actual computer program is truly amazing. 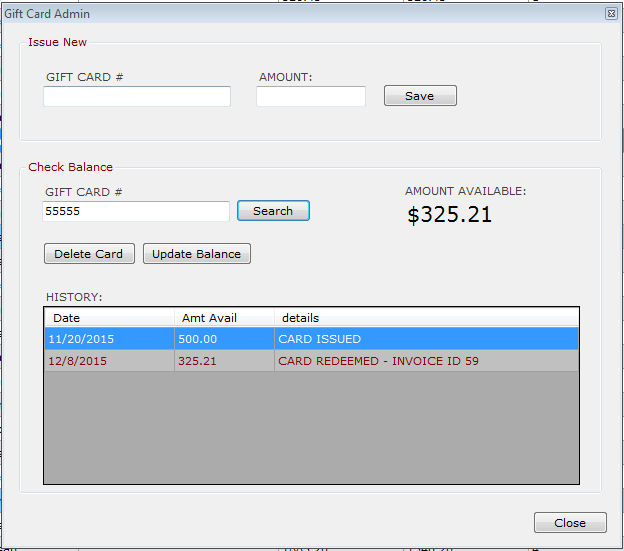 This program will not only help my store stay organized but also expand and prosper. Tasks that use to take hours and days will now take seconds. 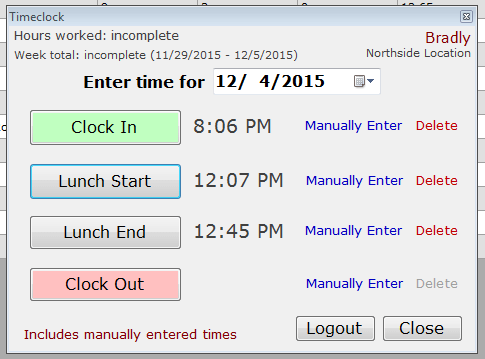 Every employee that I have here is able to quickly navigate and utilize every aspect of this software. That is an amazing accomplishment when you realize that I have employees that are in their late 60's and early 70's that are not the most computer savvy. The look of terror that was in their eyes when I first announced the system was evident. With one 30 minute demonstration of the programs capabilities even they were hooked. Does OrderTrac connect with QuickBooks ? Any data that exists in OrderTrac can be exported via CSV file which can be imported into QuickBooks. Most store find, however, that very little data needs to be transferred to QuickBooks because just about any report can be run in OrderTrac. Reports such as taxes collected, cost of goods sold, etc are all available in OrderTrac. Will I have to pay for future upgrades ? No! Instead of repurchasing OrderTrac in a couple years when more features are available, the annual license allows all upgrades and updates to be available to you instantly. Can multiple users use OrderTrac at the same time ? Yes! One computer serves as the OrderTrac ‘server’ computer which stores all the data. You can then connect as many ‘client’ computers as you wish, and all computers can be used at the same time. This means a couple sales computers, one for the warehouse, a few in the office for tracking orders, creating purchase orders etc! Is a free trial available ? Yes, with the only limitation being a limited number of invoices and customers. This allows you to test drive all features to see how OrderTrac works and how it can make your business run easier. How does licensing work ? OrderTrac runs on annual licenses. The annual license includes unlimited support and all future upgrades and updates. Payments are made monthly. Why should my store use OrderTrac ? OrderTrac was designed specifically for an Amish furniture store. There is no other inventory software designed for Amish stores that can gracefully handle custom orders, which is a requirement for Amish stores. 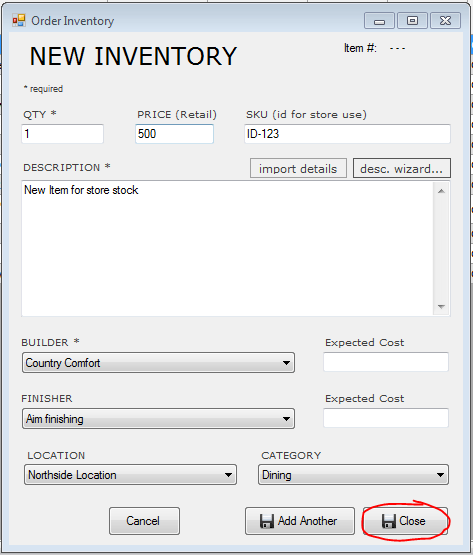 Quickbooks POS nor any other off the shelf inventory system can track the 6 week turnaround common in the Amish furniture industry. Give us a try, every store that has loves how much time it saves! How is OrderTrac Made for Amish furniture? When the shipment arrives, select the item and mark is as received. This updates the item to an ‘On Hand’ status. Inventory is tracked the same way. New inventory is added here. The new item is automatically assigned to the ‘To Be Ordered’ status. 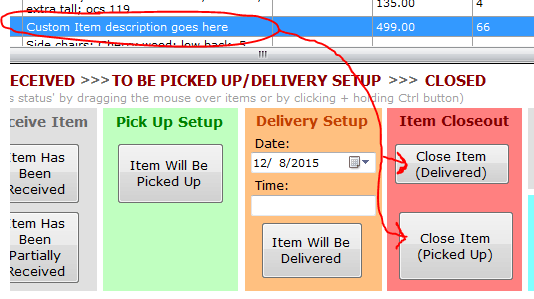 The item is then ordered as shown before on the ‘Submit Order to Builder’ tab. There are many pre-built reports available (1) or you can even build your own (2). 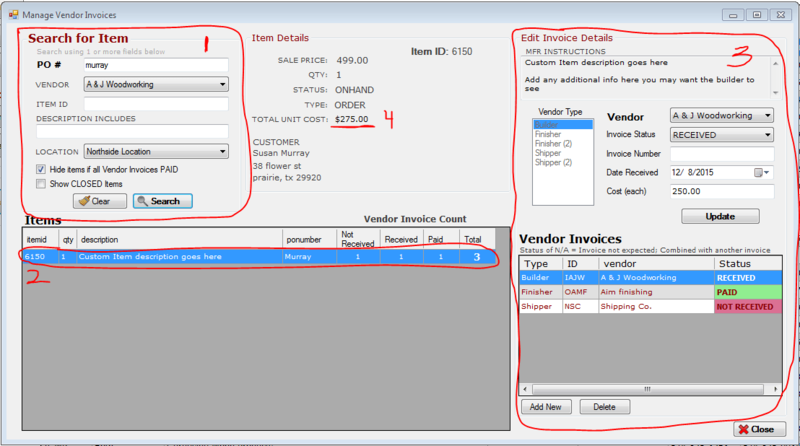 Update vendor invoice details for all all invoices related to that item (3), and view the item’s total cost (4). 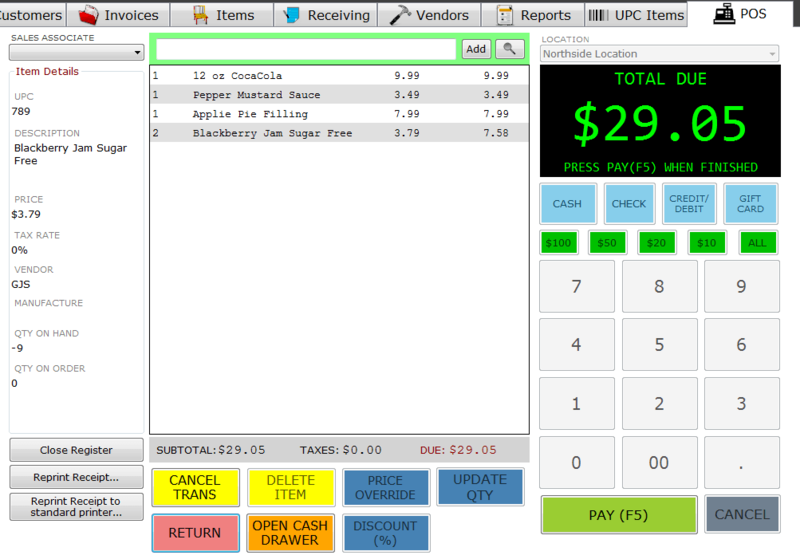 You can use the POS register tab to proccess transactions for standard barcoded items like food, gifts, etc. Get a quick glance at how your business is doing. View how sales compare to last 3 years. Know exactly what needs to be ordered, what is on order, etc. for both store inventory and for the customer. No more cash mysteriously missing from the register! View all payment received and by who. OrderTrac can share data between as many computers as you want, so everybody can be working at the same time. Keep track of all your customers, and search for their past orders in seconds. View and print both pre-built and custom reports. You can even have a daily report automatically emailed every day containing an overview of the day's sales and payments collected! No more wasting time standing in front of the fax machine. Send faxes directly through OrderTrac. Track the vendor invoices for each item to track the cost of the item as well as verify you are only paying the vendor once! Create barcodes labels for your inventory so you can quickly process transactions. Feel the peace of mind knowing all your data will be safely backed up in case of a computer failure, fire, or natural distaster. Import existing customers, or export customer lists for a mailing campaign. Also import Inventory and suppliers. Print reports or manage your business even when you are traveling using VPN technology.